If you have signed up for Scottish Book Trust’s mailing list, you will have received their Christmas e-mail complete with a link to suggestions of 21 ways to procrastinate online this Christmas. Check it out. There’s a website recommendation from me in there too. Do you have a favourite book or reading related website, video, blogs etc. that you would like to recommend? Which palace would you prefer to live in? The one on the left, Palácio Nacional da Pena, looks all colourful and quirky from the outside, but inside the rooms are small, dark and overstuffed with furniture and ornaments. 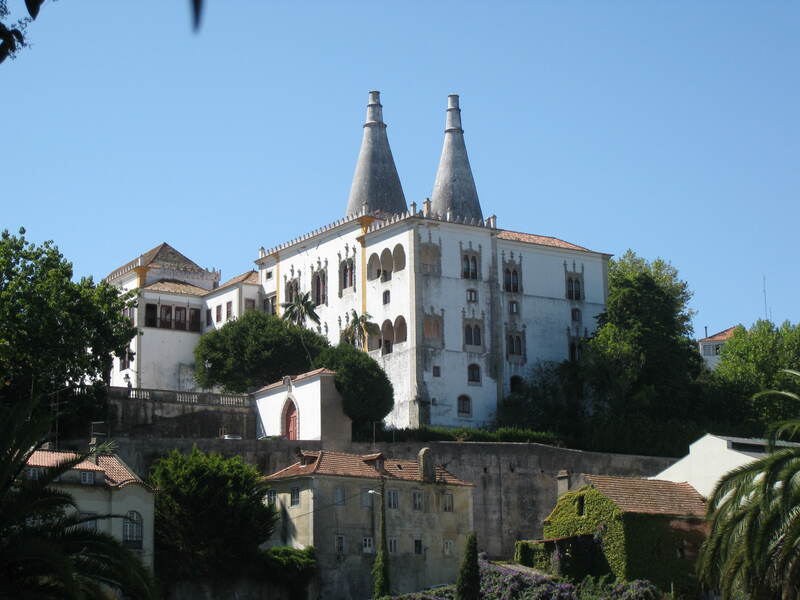 The one on the right, Palácio Nacional de Sintra, is less breathtaking from the outside (although the double chimney is quite cool), but the rooms inside are spacious and light and decorated with beautiful azulejos. It is also conveniently situated in the town centre, unlike it’s whacky counterpart which a one hour uphill hike from the Portugese town of Sintra. 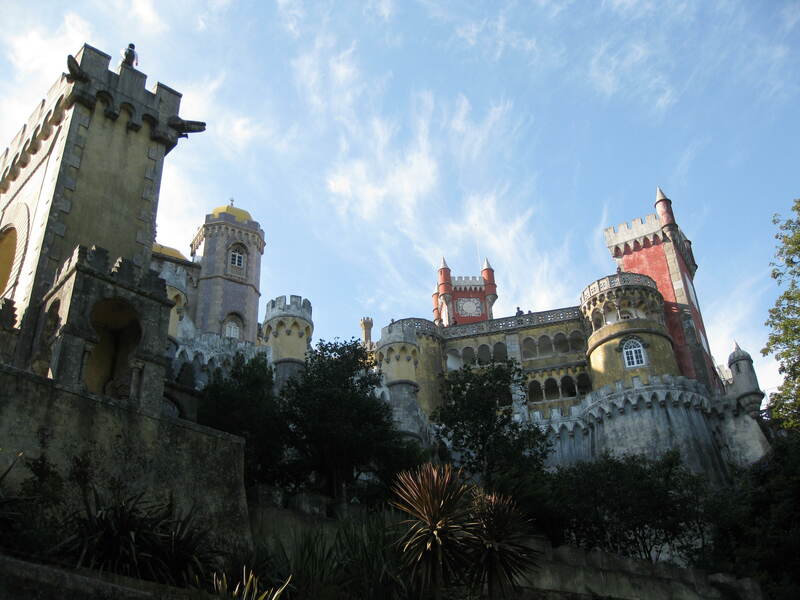 We (my sister and I) decided that we would choose the Palácio Nacional da Pena on the condition that we could put a helicopter pad on the roof and redecorate the interior. Now who’s going to buy it for me? Aside from gallivanting around picturesque palaces, we spent an enjoyable couple of days exploring Lisbon, eating Belém tarts and reading. I read two of Andrea Camilleri’s Inspector Montalbano Mysteries – light, lyrical Sicillian crime novels with mafia, drugs, femmes fatales and gourmet Italian meals all thrown into the mix. I didn’t start at the beginning of the series because although my parents have the first three or four books at home, my sister and I bickered about who would get to read them first with the result that neither us got to read them. Catarella’s appearances in the books are, however, so infrequent that I wonder why my friend thought his peculiar dialect would be a barrier to translation. Perhaps the books were originally written entirely in dialect but only Catarella’s small contributions have made it into the English translations to provide a little flavour? Regardless, the English versions are lively, colourful and delicious reads, ideal for whiling away hours on a sunny beach. What are your holiday reading recommendations? On a couple of occasions, when I have mentioned that I am writing a novel, someone will say, “Oh, have you tried writing short stories?” Well yes, I have, but that doesn’t really mean anything. A short story is not a miniature novel and writing short stories is not training for writing a novel. They are completely different forms. Just from my own reading and writing experience, it seems that novels are much more structured and plot driven than short stories, which often focus on a single turning point in a character’s life. If you want to write short stories, you need to read them. There are a number of magazines that publish contemporary short fiction, Mslexia and Ambit are just two examples. On the Mslexia website you can read short stories in the New Writing section and on the Ambit website you can download a free issue. You can also read many short stories online at the New Yorker, including my absolute favourite short story, A Stone Woman by A. S. Byatt. I apologise for the long absence from this blog. First it was Christmas, then it was New Year and with all the great TV that is shown around those two holidays, I didn’t get a chance to come online. I didn’t spend the whole of the festive season in front of the box, though. I also managed to get some important reading done. I’ve just finished Stephen King’s On Writing, which has been recommended to me by so many people that I have come to the conclusion that it is THE book for aspiring authors. It’s full of practical advice and a you-can-do-it attitude that made me want to throw the book aside and get on with my own writing projects right away. King’s memoirs, which make up the first section of the book, are funny and inspiring. This is a MUST for the writer’s bookshelf. Another staple of the writer’s bookshelf, so I’ve been told, is Strunk and White’s The Elements of Style. I’ve just managed to get my mitts on a copy and after only five pages, I am itching to go through all my short stories to rearrange the commas. I try not to get engrossed in reading a novel during the same period of time when I am writing. Reading something that someone else has written is always going to be easier than writing something yourself and I find it too much of a distraction. Also, I find myself sometimes mimicking the style of the author I have just been reading so that a short story that started out in 1st person present tense transforms suddenly into a 3rd person past tense narrative after a reading break. Now that I am getting into unknown territory with my NaNoWriMo attempt, never having written anything of that length before, I am itching to pick up a novel to read, if only to reassure myself that I’m on the right track. To satisfy my cravings, I’ve been leafing through some books that I’ve already read and particularly enjoyed, dipping in at my favourite parts. It’s much easier to put these books down again because I already know what happens and am not tempted to keep reading till the end. I cannot imagine a more pleasurable way of spending my breaks between writing than revisiting the humourous scenes from Captain Corelli’s Mandolin and the breathtaking moments in The Time Traveller’s Wife while avoiding the heartbreaking moments that come in between.